UPTrails.com is a work in progress; work that will hopefully continue for some time as we continue to explore Upper Michigan. The initial purpose of this site was purely personal - I wanted to create a site to store all of our trail maps as I cannot seem to find when I really need them. They were all spread out in vehicles, backpacks, jackets, or just destroyed from a rainy hike. I wanted a single location that I could always go to and print off or just review a map when I need it. Once we got going on the site I thought that it was just too nice to keep for ourselves and that others may also benefit from it. I realize that there are other sites that provide a similar service but we are going to strive to make this one of the best. 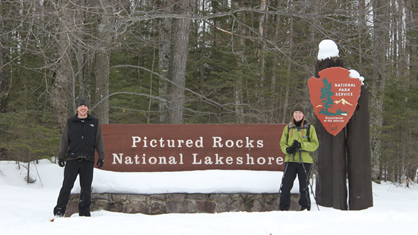 I hope that by consolidating all of these resources that exists on dozens of others sites it will be easier for others to get out and enjoy the natural beauty of Upper Michigan that we love so much. We welcome your feedback and suggestions on the site. If you have used any of the trails we have listed please consider posting a review so others can benefit from your experience. We also ask that if you are aware of a trail that we don't have listed that you tells us about it so we can include it on the site. There are many trails that we have yet to discover and for this site to be successful we need your help. The more trails we can include, the more helpful this site will be for all. If you would like to receive periodic updates as trails are added to this site, join the email list. We can then keep you informed as the site grows. Thanks for your input and enjoy - let's get outside!